Battle Photographic Society (BPS) have recently held four competitions, which were open to all members; seven of the winning shots are on this page. The winners of the Mono Competition were decided at the club’s meeting on March 25. In first place was Mike Fermor with ‘Full Steam Ahead’. Sue Farrant took second place with ‘Bosham’ and third place went to Chris Keightley, with ‘Lone Mission. The winners of the Portrait Competition were, in first place Jeremy O’Keefe with ‘The Old Walker’, in second place Richard Bridon with ‘Bald Eagle’ and Chris Keightley received third place with ‘Golden Boy’. Chris Shore encouraged members to enter their photographs to the Photographic Alliance of Great Britain to gain awards at a higher level. BPS Chairman Steve Barnes said the judging of the photographs had been accompanied by many stories and humour and the whole evening had been dynamic. On April 1, BPS welcomed Robin Harmsworth from Tonbridge Grainmakers to judge the 3rd Monthly Print Competition. The winners in Grade 2 were Linda Douglas for ‘Watching You in Guadeloupe’, Sue Farrant for ‘Mumbles Pier’ and Jacob Smith for ‘Foundry Life’. The winners in Grade 1 were Chris Keightley for ‘Sunrise, Bexhill Beach’, Bob Butler for ‘Skateboard Graveyard’ and Mike Fermor for ‘Early Morning Walk along the Rother’. On April 15, the third Monthly PDI Competition was held. In Grade 2, joint first place winners were Linda Douglas for ‘Walking the Dog at Sunset’ and Sue Farrant for ‘Mumbles Pier Tiara’. Third place was Richard Holttum for ‘Big Sea, Hastings’. 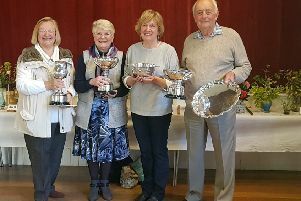 In Grade 1 six members jointly received the highest marks; Jan Butler for ‘Shiny Shoes’, Sandra Cupitt for ‘Walk on By’, Denise Hart for ‘Lioness’, Louise Pemberton for ‘Grey Heron on Lookout’, George Rowson for ‘Flight’, and John Shipp for ‘Guardian Groynes in Curious Light’. The BPS Annual Exhibition will be held at Battle Memorial Hall on Sunday, May 26, 10-5pm and Monday, May 27, 10-4pm. All are welcome.